Sample letter to your uncle for thanking him for sending you a gift on your birthday (laptop, watch, Cash etc) from local or abroad. 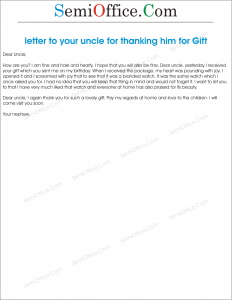 Sending a thanks letter to your uncle after receiving the gift will also ensure your next gift. How are you? I am fine and hale and hearty. I hope that you will also be fine. Dear uncle, yesterday I received your gift which you sent me on my birthday. When I received the package, my heart was pounding with joy. I opened it and I screamed with joy that to see that it was a branded watch. It was the same watch which I once asked you for. I had no idea that you will keep that thing in mind and would not forget it. I want to let you know that I have very much liked that watch and everyone at home has also praised for its beauty. Dear uncle, I again thank you for such a lovely gift. Pay my regards at home and love to the children. I will come visit you soon. I am sure you would be as good as always. First of all thanks for the lovely gift you sent me on my birthday. I was feeling a big need to buy a new laptop but I was unable to purchase due to insufficient funds. I had been saving money for the laptop but last month there was a book exhibition in which I found a good book on literature on which all of the funds were invested. I was a disappointed about my sacrifice but as you know how much I am fond of reading good books, but now I think I made a good decision. Thanks again for the new laptop. I would take good care of it . I would also send you the book I bought after I have completed reading it.